7th Pay Commission latest news: The Central government employees' longstanding demand of a pay hike above the recommendations of the 7th Pay Commission have not been met. 7th Pay Commission latest news: The Central government employees' longstanding demand of a pay hike above the recommendations of the 7th Pay Commission has not been met. However, from time to time, the Centre has been announcing reliefs like dearness allowance hike. Last month itself the Union government approved an additional installment of Dearness Allowance (DA) to Central Government employees and Dearness Relief (DR) to pensioners w.e.f. 01.07.2018 representing an increase of 2% over the existing rate of 7% of the Basic Pay/Pension, to compensate for price rise. This raise came five months after the Union Cabinet chaired by Prime Minister Narendra Modi approved the release of an additional installment of DA to Central Government employees and Dearness Relief (DR) to pensioners w.e.f. 01.01.2018 representing an increase of 2 p% over the existing rate of 5% of the Basic Pay/Pension. Now, the Centre has sweetened the mood of Central government employees by extending the LTC benefits for two years. The Department of Personnel and Training (DoPT) said in an official release that the scheme, which allows Central government employees to enjoy concession on travel by air to North East, Jammu and Kashmir and Andaman and Nikobar, has been extended for two years. 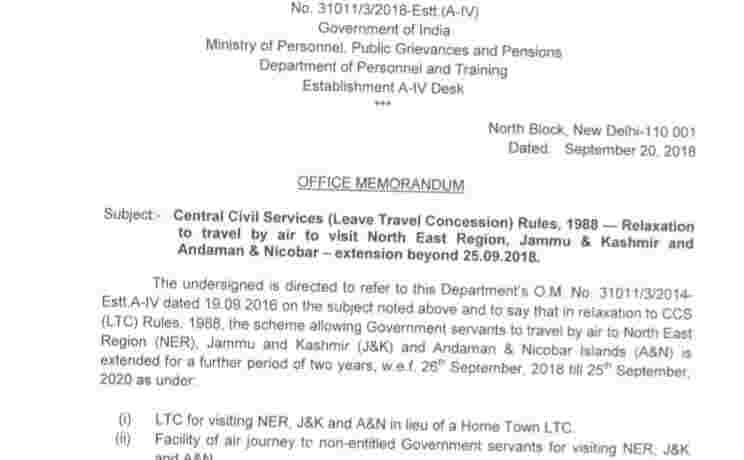 The notice dated 20-09-2018 said, "...the scheme allowing government servants to travel by air to North East Region (NER), Jammu and Kashmir (J&K) and Andaman & Nikobar Islands (A&N) is extended for a further period of two years, w.e.f. 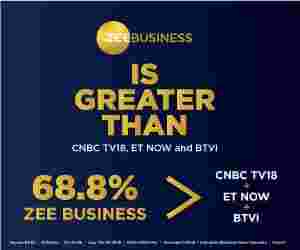 26th September 2018 till 25th September 2020 as under: 1. "LTC for visiting NER, J&K and A&N in lieu of a Home Town LTC. "; 2." Facility for air journey to non-entitled Government servants for NER, J&K and A&N. "; 3. "Permission to undertake journey to J&K, NER and A&N by private airlines." The extended LTC benefits come into effect from today.